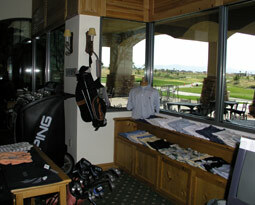 The Pro Shop at the Boulder Creek Golf Club was established to fulfill all of your golfing needs. Whether you are looking for a selection of apparel, or a specific type of equipment, we can accommodate any request through our special order program. Club fitting is always available by appointment with a member of our professional staff. Any full set of irons purchased through our Pro Shop comes with a complementary round of golf. Ashworth, Antigua, and Greg Norman Collection are just a few of the styles that we offer. Titleist, Ping, and Cleveland are stocked equipment to provide golfers with all of their playing needs. Site designed and hosted by Cybergolf.